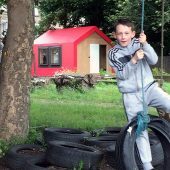 The project involved the construction of a ‘wikihouse’ in a children’s adventure playground in Glasgow over the course of two weeks in June 2016. 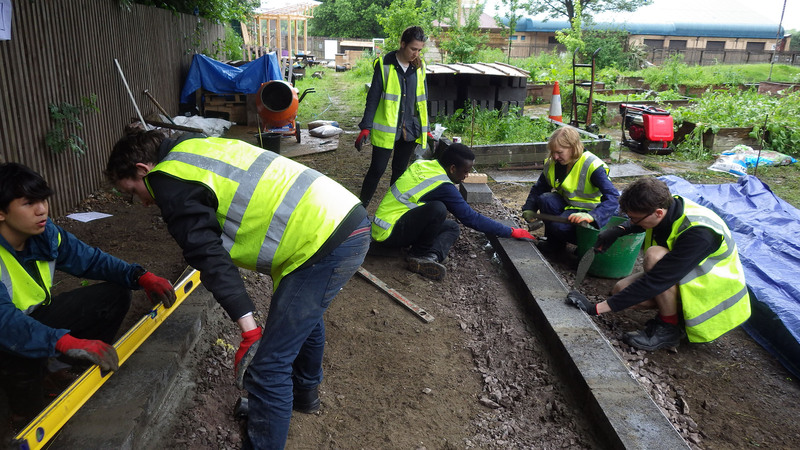 Core to the ethos of the project was the participation of the clients: local children, and users of the Adventure playground. The resulting, weatherproof insulated building has four high-quality openable windows and rooflights, and is secured. It is used as a ‘project room’ by the clients. The red membrane is a semi-permanent solution, guaranteed for 12 months, but intended to be overclad in a future collaborative project. 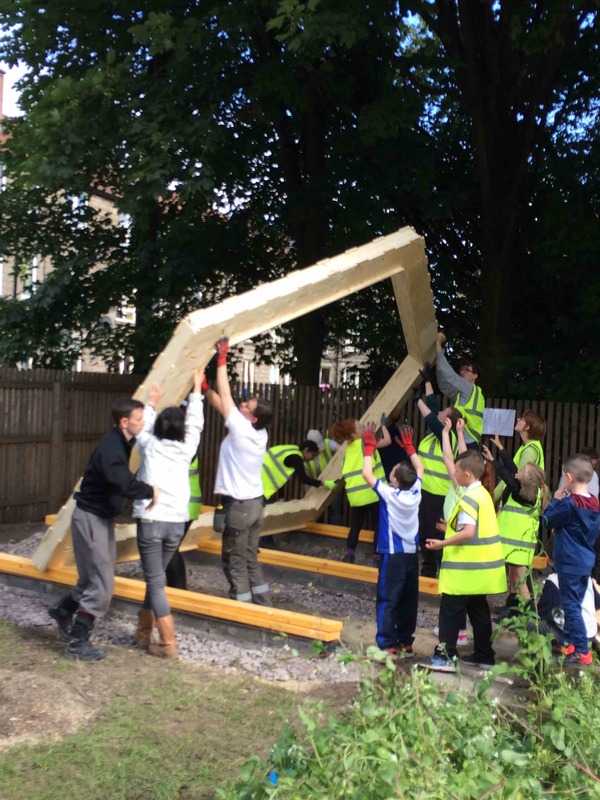 The wikihouse built on existing relationships of summer collaborations with the playground going back four years. The main aim of the project was to demonstrate the power of digital fabrication to empower communities to self-assemble high-quality construction. 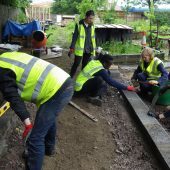 This was demonstrated through student-led design and build, collaborating (both co-designing and co-building) with children, local to Dalmarnock. Participating staff and students learned digital techniques, community engagement, and practical assembly skills. 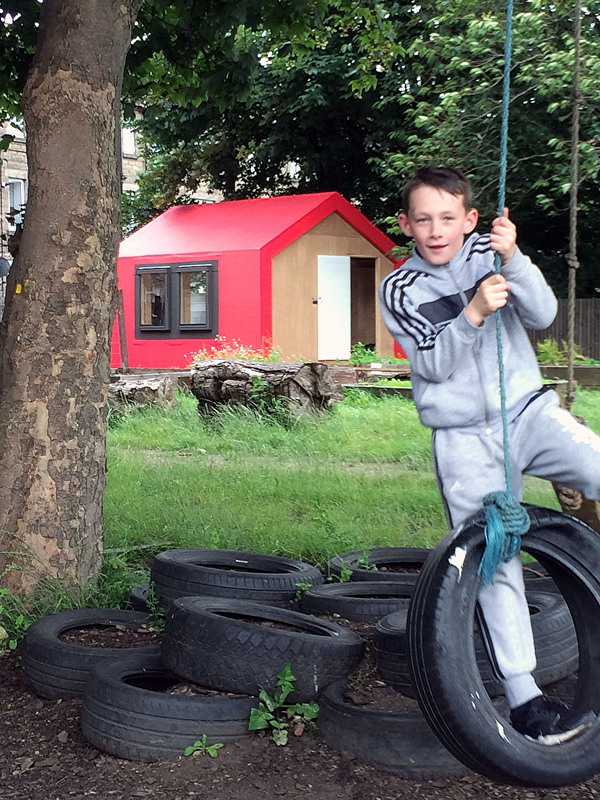 The young children engaged (aged 6-11) also benefitted from exposure to university students and staff, realising a sense of self-agency through engaging with computer-aided design, and self-efficacy through the practical on-site construction of a permanent playground store in their local adventure playground. 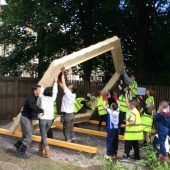 Children’s engagement with the build was enabled by the ingenious nature of the open-source wikihouse design to construct from lightweight plywood ‘jigsaw’ pieces, with nothing more than a rubber mallet. Students: Nutthannee Banditakkarakul, Teresa Boulting, Cameron Bray, Fiona Brumby, Ivan Chan, Chamithri Greru, Pallavi Gupta, Kennes Hung, Sarah Kear, Brandon Mak, Andrew Matheson, Nicola Murphy, Jonathan Paluku, Michaela Pistkova, Kirsten Ross, Mo Sriskulpinyo, Angus Stanley. Research Question: Can emerging methods of digital fabrication enable communities to engage in complex, permanent construction, and is there value in this process?